This device was announced at the Consumer Electronics Show in Las Vegas from Verizon as part of their new variety of 4G LTE devices. The Samsung Inspiration was found to be more on the "down-low" considering the hype of many of the other devices. Unfortunately, pricing and availability is not available but in terms of the device, it has many features to "wow" users. This phone is the world's first phone with "Super AMOLED Plus" giving for a clearer display in varying light surroundings. 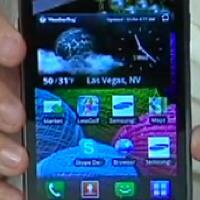 The Inspiration has a gorgeous 4.3″ touchscreen, as mentioned, and its "Super AMOLED Plus" gives 50% more sub pixels. Under the hood, the phone runs Android 2.2 Froyo, it has a front and rear-facing 8MP camera and includes varying features like Mobile Hot Spot for users to connect up to 8 Wi-Fi-enabled devices on 3G or 4G connections. Processor-wise, the phone runs the 1GHz Hummingbird variation. Other than that, not much other information has been announced, however stay tuned to TechnoBuffalo for developing details. Motorola XOOM by Motorola – 10.1-inch screen; Android™ 3.0 Honeycomb software optimized for tablets; Mobile hotspot capability provides connection for up to five Wi-Fi-enabled devices. Novatel MiFi® 4510L Intelligent Mobile Hotspot and Samsung 4G LTE Mobile Hotspot – small enough to fit in the palm of the hand, lets you share Verizon Wireless' 4G LTE or 3G networks with up to five Wi-Fi-enabled devices.